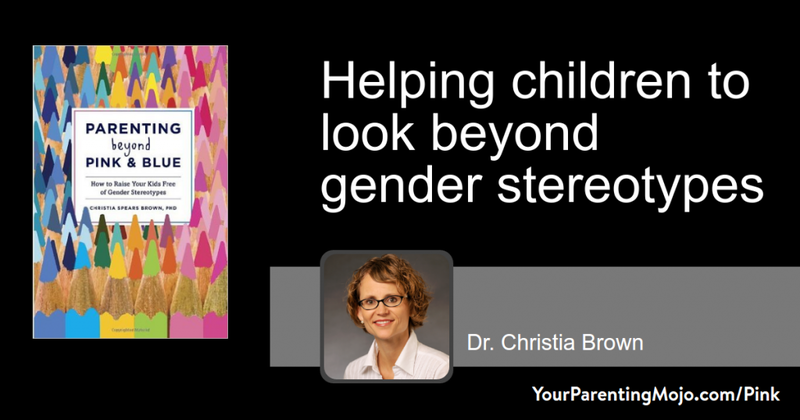 Today I join forces with Malaika Dower of the How to Get Away with Parenting podcast to interview Dr. Christia Brown, who is a Professor of Developmental and Social Psychology at the University of Kentucky, where she studies the development of gender identity and children’s experience of gender discrimination. Dr. Brown’s book, Parenting Beyond Pink and Blue (Affiliate link), helps parents to really understand the scientific research around gender differences in children, which is a harder task than with some other topics because there’s just a lot of bad research out there on this one. I ask about theories of gender development while Malaika keeps us grounded with questions about how this stuff works in the real world, and we both resolve to shift our behavior toward our daughters just a little bit. I have been listening to your podcasts for a number of months now and very much enjoy them. My parenting leans towards RIE and AP but I am not perfect at all. This episode might be among my favorites also because it is such an important topic. I had one problem with it though and it might not have occurred either of you but the focus was very much on girls – how to point out all the women in male dominated jobs etc. that’s important of course. But I missed strategies for boys. I have a son (as well as a stepson and -daughter) so it’s important to me to fight all the boy related stereotypes. I was at a children’s event recently where face painting was offered. The girls got to choose among a variety of pictures (flowers, butterflies, cats etc) while for the boys it was pirates or action figures. Anyway, just wanted to let you know my thoughts and have been meaning to do that for quite a while already. Thank you for your work! I LOVE you podcast, Jen! — It has been exactly what I was looking for: academic but human, and you introduced me to RIE which has been a game-changer in my relationship with my two-year-old son. I am an art therapist, so the episodes on creativity and learning hit on my artistic side, and the episodes that delve into gender and culture help me plug my my social-justice/therapist side into parenting. One thing that struck me with this episode: Malaika mentioned how she tends to dress her daughter in clothing from the boys’ department, describing how she feels like this fits her daughter’s high activity level. I find myself doing the opposite action for what I thought was the same reason: I tend to buy him leggings and “jeggings” from the girls’ department because they’re stretchier (easier to move in) and less baggy (less likely to get caught in things that he’s tumbling on), thinking that girls’ pants are easier for my son to be active in … but now I’m wondering if I have been using that rationale to avoid pushing him into clothing that I associate with masculine stereotypes. And I’m thinking as I type this that we often have multiple reasons for the choices we make, many of them unconscious… which fits into this episode’s message of talking about these underlying beliefs in an open way. Thanks for doing the research for me, and prompting me to think through the many, many choices I make each day that affect my vibrant, adventurous, creative child! Sorry for the slow response on this one, Rachel – funny you should mention it, but I was actually struck by the same thing while Malaika was talking. We dress Carys in leggings and t-shirts (when we can get her out of pajamas!) because to us it seems as though they allow freedom of movement. But yes, I think the ultimate goal is not to determine once and for all whether leggings or baggy pants are best for our child but to see what kind of clothes our child is most comfortable in, and to examine our impressions of and assumptions about that style of clothes if it veers away from traditional gendered clothing options. Glad you find the show useful!